UPDATED: Tue., Feb. 27, 2018, 7:29 p.m.
Washington State redshirt sophomore Borislava Hristova, the third-leading scorer in the Pac-12 Conference, was named to the 15-player all-conference team Tuesday. The Bulgarian native averaged 18.1 points and posted 11 games of 20 points or more for the Cougars, who face USC in the first round of the Pac-12 tournament on Thursday in Seattle. Hristova won a player of the week award during conference play after blitzing Colorado and Utah for 32.5 points per game on 65.9 percent (29-of-64) jump-shooting over the second weekend of conference play. Hristova leads the Cougars into the Pac-12 Championships Thursday against the No. 7 seed Trojans. The game is scheduled for 6 p.m. at Key Arena in Seattle and can be seen on the Pac-12 Network. Since the West Coast Conference women’s basketball season began, the target has been on Gonzaga’s back. 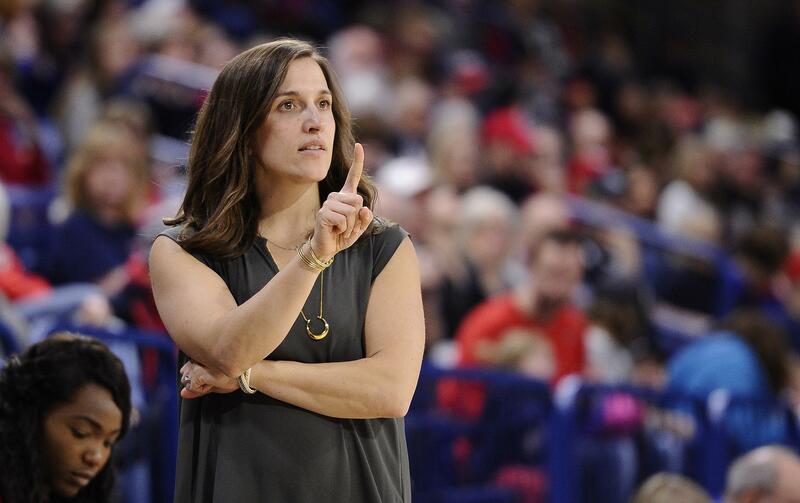 However, Tuesday was the occasion for a hearty pat on the back from their WCC rivals, as Gonzaga’s Lisa Fortier was named the Coach of the Year and Jill Barta the Player of the Year. Fortier won the coaching honor for the third time in her four years as head coach, capping a record-breaking season for the Bulldogs, who are 24-5 overall heading into this week’s WCC Tournament in Las Vegas. That too is a team award, said Fortier, referring to assistants Jordan Green, Stacy Clinesmith and Craig Fortier, plus the rest of the staff. “We joke all the time, that they’re hiding my deficiencies,” Fortier said. “Any coach would be crazy not to go into their assistants’ office and give them all a high five. “And that’s what we did,” added Fortier, whose top-seeded Bulldogs will face Pepperdine or Santa Clara in the quarterfinals at noon Friday at the Orleans Arena. Along the way to that top seed, GU reeled off 15 consecutive wins and went 17-1 in the conference, the most wins by any school in WCC history. The Bulldogs also claimed the regular-season title with three games to play, matching the earliest clinching in school history. A big reason was Barta, a junior forward from Fairfield, Montana, who is GU’s first conference MVP since Taelor Karr in 2012-13. The sixth GU player to win the award, Barta averaged 17.5 points and 7.9 rebounds, leading the Zags in both categories. Barta, a three-time, first-team all-WCC pick, also shot 47.4 percent from the field and 85.6 percent from the line. She finished in the WCC’s top 10 in eight categories despite averaging just 27 minutes in league play. “She’s become a much more well-rounded player,” Fortier said. Even though GU won the conference by four games, Barta was the only Zag on the 10-player first team. Two juniors, forward Zykera Rice and guard Chandler Smith, made the second team. Rice, from Tacoma, averaged 12.2 points and 5.3 rebounds. Smith, out of Brewster, Washington, averaged 10.1 points and 5.9 boards while also dishing out 73 assists. Forward Jenn Wirth made the all-freshman team. The others are first-team selections are guards Stella Beck of Saint Mary’s, Brenna Chase and Cassie Devashrayee of BYU, Gabby Green of Loyola Marymount, GeAnna Luaulu-Summers of Pacific, Anna Seilund of USF and Aubrey Ward-El of San Diego; and forwards Megan McKay of Saint Mary’s and Yasmine Robinson-Bacote of Pepperdine. BYU freshman Sara Hamson earned Defensive Player of the Year and Green, a Loyola Marymount junior, is the Newcomer of the Year. Published: Feb. 27, 2018, 9:45 a.m. Updated: Feb. 27, 2018, 7:29 p.m.